The Ecclesia Apostolica Divinorum Mysteriorum is a dependent community of the Apostolic Episcopal Church and the Abbey-Principality of San Luigi that is particularly concentrated upon the ecclesiastical Templar tradition. It is closely associated with the Order of the Crown of Thorns. To some extent the double revival of the Order of the Crown of Thorns in 1883 and 1891 respectively may be seen as a manifestation of the general fascination with the Templar chivalric heritage that was a feature of nineteenth-century Romanticism. As such, it was a part of the revival of interest in the spiritual legacy of the Templars dating from the beginning of that century that had culminated in the rediscovery of the Larmenius Charter of Transmission. This revealed the apparent succession of secret Templar Prince Grand Masters from Jacques de Molay (d. 1314) to the incumbent who took office on 4 November 1804 at the head of the revived Ordre du Temple, Bernard-Raymond Fabré-Palaprat (1773-1838) (pictured right). The Ordre du Temple took a position of opposition to French Grand Orient Freemasonry, which was viewed at the time as a threat to the Empire, and received the approval of the Emperor Napoléon I as such. It also enjoyed the protection of King Louis XVIII from 1814. In 1812, Fabré-Palaprat formed the Eglise Johannite des Chrétiens Primitifs, basing this body upon an esoteric interpretation of the teachings of St. John. The Lévitikon of the Athenian monk Nicephorus, which was discovered by Fabré-Palaprat in 1814, provided further evidence of a lineage that connected the Knights Templars directly to Jesus Christ. Fabré-Palaprat’s church subsequently became associated with the radical Eglise Catholique Française under its co-founder and Primate François-Ferdinand Toussaint Châtel (1795-1857) (pictured left). The Eglise Catholique Française, which was forcibly closed under Papal pressure in 1843, provided the inspiration in turn for a revival in 1870 under Old Catholic Fr. Hyacinthe Loyson (1827-1912) and for the eventual foundation of the Eglise Catholique, Apostolique et Française, which elected Prince-Abbot Joseph III of San Luigi as its Archbishop-Primate in 1906 and was united with the Eglise Catholique Gallicane, also founded by Loyson, in the following year. The history of Fabré-Palaprat’s Templar order subsequently is one of division and absorption into other esoterically-minded institutions, and it was not long before it had become predominantly, if not exclusively, Masonic in its membership, albeit divided between adherents of the Strict Observance and the Grand Orient de France. The legitimist “palaprien” elements were recognized by decree of the Emperor Napoléon III in 1853, but went into decline and had all but died out by the end of the nineteenth-century. The principal Templar Orders that are to be found today claim their descent from the 1804 foundation via a 1945 revival under Don Antonio Campello Pinto de Sousa Fontes (1878-1960); there are several successions of Prince Grand Masters that are traced by these organisations from Fabré-Palaprat to today. What is often overlooked in these matters is that alongside the various lineal successions of the Grand Magistry of the Templar Order, there also exists a parallel and continuous episcopal succession that originates with Pope Benedict XIII in 1726 and passes through Fabré-Palaprat, who (as “Raymond de Spolète”) received episcopal consecration in this lineage on 29 July 1810. Interestingly, this lineage intersects with the succession from Archbishop Joseph-René Vilatte (Prince Joseph III de San Luigi), because Archbishop Joanny Bricaud (1881-1934) received both consecration in the Templar lineage in 1907 and conditional consecration in the Syro-Antiochian succession in 1913. It was Bricaud who consolidated the Templar and other esoteric lineages together to form the Eglise Catholique Gnostique, and was elected the first Patriarch of that body in February 1908 under the title Tau Jean II. He was a close associate of Prince-Abbot Joseph III in his later years and was responsible for the origins of the American Chapter of the Order of the Crown of Thorns. From Bricaud, the line descends to the late Robert Amadou (1924-2006) of the E.C.G. and the Syro-Antiochean Church, who in 1988 entered into intercommunion with the Apostolic Episcopal Church. This clandestine Templar line of succession, confirmed by research in the Vatican’s Secret Archive, was received by the present Prince-Abbot of San Luigi, Archbishop John Kersey (Edmond III), at his consecration and enthronement for the Apostolic Episcopal Church in 2008. He is thus tenth in episcopal succession from Fabré-Palaprat. 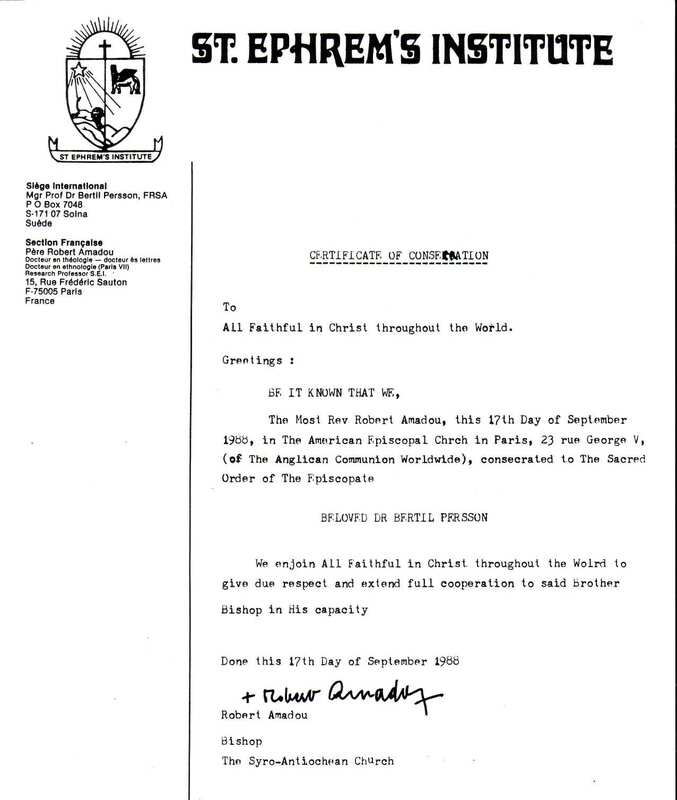 Pursuant to a charter of authority issued by the Apostolic Episcopal Church in Great Britain, with the support of the AEC worldwide and the Order of Corporate Reunion, the formal inauguration of the Ecclesia Apostolica Divinorum Mysteriorum (E.A.D.M.) accordingly took place during a celebration of the Eucharist at the dawn of Easter Day, 2010, with Archbishop Kersey becoming its first Metropolitan Primate. In 2011, the administration of E.A.D.M. became united with that of the Abbey-Principality of San Luigi and the Order of the Crown of Thorns when Archbishop Kersey was elected to responsibility for those bodies. In October 2012, a comprehensive revision of E.A.D.M. was undertaken in the light of the promulgation of the St James Declaration which addressed several aspects of its mission. E.A.D.M. is thus a fully integral jurisdiction of the One, Holy, Catholic and Apostolic Church devoted specifically to the inner Johannine tradition, which has existed as an underground stream within the One Holy Catholic and Apostolic Church since its inception. It pursues that tradition in harmony with the Catholic and Orthodox expressions of the outer church, and teaches that the inner and outer traditions are not merely linked but co-dependent, with the nurturing and development of the inner tradition vital for the future development of the church. The inner and outer church are thus aspects of a single entity sharing in a common destiny: this is reflected in the name E.A.D.M., which is a homophone for the Latin eadem, meaning “by the same means”. By designating our jurisdiction as an ecclesia, we use the term used by the first Christians for their assemblies; a term that deliberately has both local and universal meaning, and that thus establishes us as a part of a wider structure and context. The teachings of E.A.D.M. are directed at the encouragement of a personal and profound experiential relationship to the Divine Essence, referred to as gnosis. Gnosis is the subject of many significant writings of Clement of Alexandria in particular; it is communicated through the transmission of Holy Orders as gateways to Light and Life, with the seeker following a threefold path of Purification, Illumination and Union. The central work of E.A.D.M. is found in the private celebration of the Holy Sacrifice of the Mass, the commitment of individual clergy to study and spiritual self-improvement, and the observance of the feasts of the Ecclesia. Historical research is a major emphasis for E.A.D.M. E.A.D.M. is an autonomous Catholic ecclesia. It is a constituent and integral part of the One Holy Catholic and Apostolic Church and is not an independent church, an order of chivalry or a charitable organisation. E.A.D.M. shares aspects of its history with a number of other entities. However, it is not today connected with any other Templar organisation or order, nor is it Masonic in nature. E.A.D.M. does not regard debates as to the historicity and authenticity of the Larmenius Charter, the Levitikon or other documents as of relevance to its work, and takes no official position on these matters. It regards the historical fact of its Episcopal Succession from the Catholic Church via Fabré-Palaprat as sufficient authority for its mission. E.A.D.M. conducts research into matters of belief that include esoteric teachings, and affirms its position as a lineal descendant of the Eglise Catholique Gnostique of Archbishop Joanny Bricaud. However, E.A.D.M. professes the undivided Catholic and Orthodox faith in keeping with the position of the Abbey-Principality as a whole, and does not accept any form of esoteric teaching as de fide, nor does it countenance any form of heretical belief. E.A.D.M. serves as an inner counterpart to the worship and other external activity of the Catholic Church. Its services are private and reserved to members only. No form of external or public worship is provided. Membership is confined to clergy in the minor and major orders. There is also a limited provision for ordinands. While a number of clergy serve additionally within the Order of Antioch and/or the Apostolic Episcopal Church, it is not a formal requirement that they should do so, nor is such service possible for all members. the Nativity of Our Lord; the feast of St. Stephen; St. John the Evangelist; the feast day of the Holy Innocents; the eighth day of Christmas, which is New Year’s Day; Epiphany; St. Mary Candlemas; St. Mathias the Apostle; the Annunciation of Our Lady in March; Easter and the three days following; St. George; Ss. Philip and James, the two Apostles; St. Mary Magdalene; St. James the Apostle; St. Laurence; the Assumption of Our Lady; the nativity of Our Lady; the Exaltation of the Holy Cross; St. Matthew the Apostle; St. Michael; Ss. Simon and Jude; the feast of All Saints; St. Martin in winter; St. Catherine in winter; St. Andrew; St. Nicholas in winter; and St. Thomas the Apostle. designated as Tau Eleutherius within E.A.D.M. A public listing of other clergy is not provided at this time. A full bilateral Treaty on Friendly Relations and Co-operation between E.A.D.M. and the Kingdom of Bunyoro-Kitara entered into force on 15 February 2012.